Enjoy Your Vitamin Activity To The Fullest! We Save You Energy On Looking Everywhere For Your Sunglasses! Tired of looking for your sunglasses, while you're in the middle of your refreshing fishing or sailing? Have you had enough with your hanging eyeglasses preventing your free movement in your boating adventures? Captain's Choice is REVOLUTIONIZING the boaters' accessories with a plastic sunglasses case featuring powerful suction cups that will be easily mounted on all your boat surfaces! Get Your Hands On A Ground-Breaking Suction Case! Forget about the headache of looking everywhere for your sunglasses while fishing! No more ugly eyeglass strings will spoil your stylish looks in your relaxing sailing! 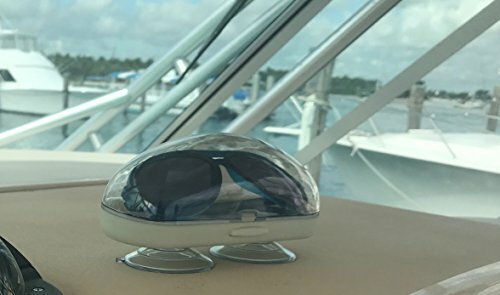 We have released the FIRST sunglasses case on the market that features SUCTION CUPS, to save you the nerve-racking search for your sunglasses all over the boat! Mount It On Every Surface Of Your Boat & Enjoy Your Sailing! The novelty design of this safety sunglasses case guarantees that you will never again waste time looking for your sunglasses all over. Instead, you will rest assured that their case is FIRMLY FIXED on the surface of your choice and at hand when you need it. Made of premium plastic, this protective sunglasses case will be saving your eyewear from accidental drops and loss for a long time. A MUST-HAVE Boater's & Fisherman's Accessory! Experience the convenience of a portable plastic sunglasses case that stays mounted wherever you need it to be, without sliding or slipping! JOIN THE NEW TREND IN EYEWEAR CASES with a clear plastic sunglasses case that will be easily mounted on any surface of your sailing or fishing boat, to save you energy on looking for your glasses. STRONG RELIABLE MANUFACTURE: Made from sturdy plastic material and featuring powerful suction cups, Captain's Choice sunglasses case makes a safe protective case with guaranteed longevity. TRENDY EYE-CATCHING DESIGN: The clear plastic top cover manufacture and the timeless white bottom make this plastic eyewear case the #1 modern accessory for male and female boating &fishing addicts. OFFER IT AS A THOUGHTFUL GIFT to a loved sailing or fishing enthusiast and help them get rid of old-fashioned hanging eyewear! Show off your excellent taste with a stylish & functional suction sunglasses case! YOUR 100% SATISFACTION-OUR BUSINESS! We back our plastic sunglasses case with unconditional Full Refund Policy and our warm & fast Customer Service, to help you buy with confidence. If you have any questions about this product by Captain's Choice, contact us by completing and submitting the form below. If you are looking for a specif part number, please include it with your message.